I had trouble sleeping last night because I kept coughing, so it was a long, tired day at school. Sixth graders started a new unit about expressions used when making phone calls. YH mentioned that we have a "business meeting" tomorrow afternoon. I don't know where it is, but I think he's driving me. All I know is that we're leaving at two. My second grade after school class learned Five Little Monkeys which they liked, but I really killed my voice that period. And my first graders learned shapes - we made some out of pipe cleaners. 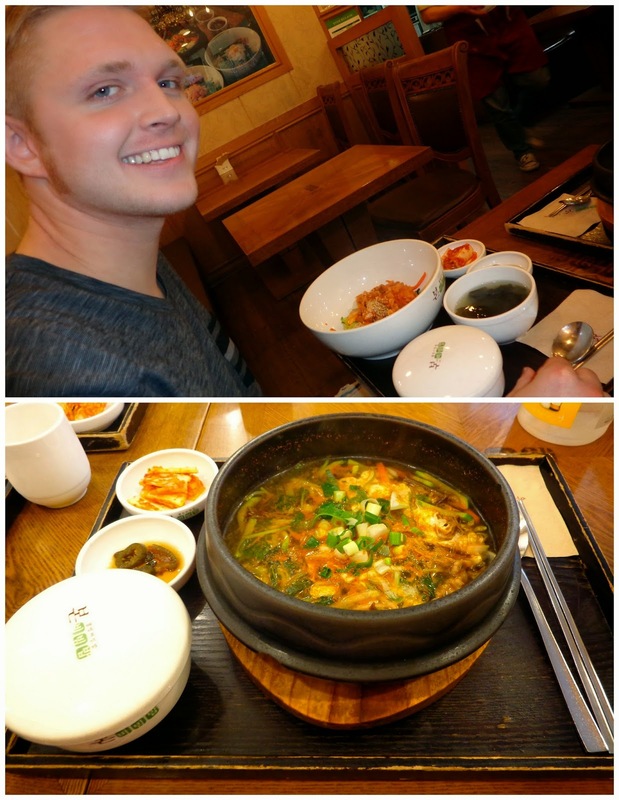 John went into Seoul by himself today and ventured around Itaewon, the foreigners' district. He ended up seeing a doctor to get a prescription for his inhaler so that he could buy some here at a Korea pharmacy for $9 each. So smart for Americans to take advantage of cheaper medical costs when abroad! We went and had shabu shabu in town for dinner. So delicious but I am sooo full! Sixth grade classes went well with YJ. She told me that Thursday is picture day, so I should dress up. Then two o'clock rolled around and passed. My other co-teacher and I actually left around 2:20 for the "business meeting". On the way he mentioned which period from the book we'll be doing for our open class in June, and something about a consultant. Wait what?? We're meeting with someone to discuss our lesson plans for this open class, and I haven't even seen the period in the book yet? After we signed in and got seated, it became clear that yes - each English teacher with an upcoming open class would be paired with a "consultant" to talk about lesson plan ideas and get advice. All of the handouts were in Korean. One I think is a rubric of what we'll be evaluated on, so it would have been helpful to have that information in English. I'm not sure if my co-teacher will ever have time to sit down and translate it with me. I wish I would have known what the meeting was about ahead of time, so I could have prepared some ideas and questions about the lesson to make use of our consultant's time and expertise. So the trip felt a bit of a waste. 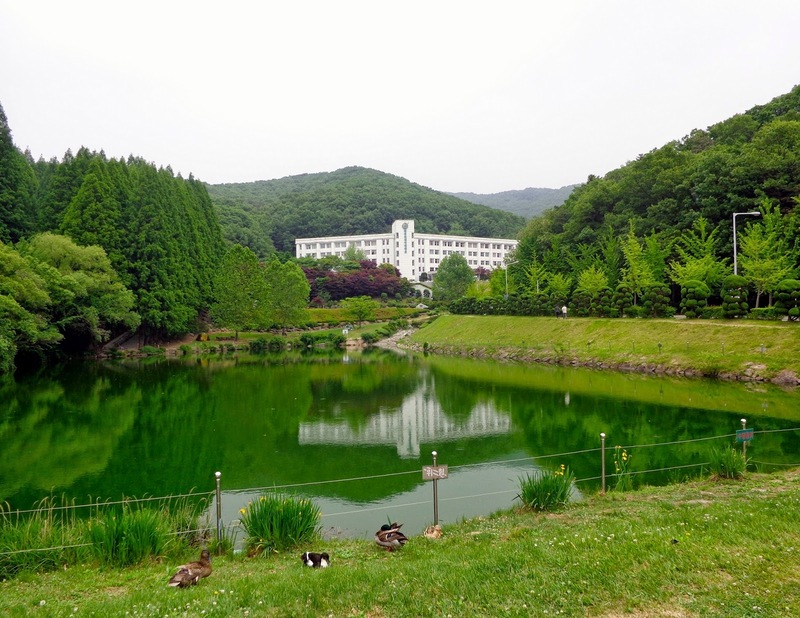 John went into Bundang today, a wealthy suburb just 45 minutes from my town by bus. It has its own subway line, which is connected to metro lines in Seoul. He enjoyed himself in an arcade that afternoon. 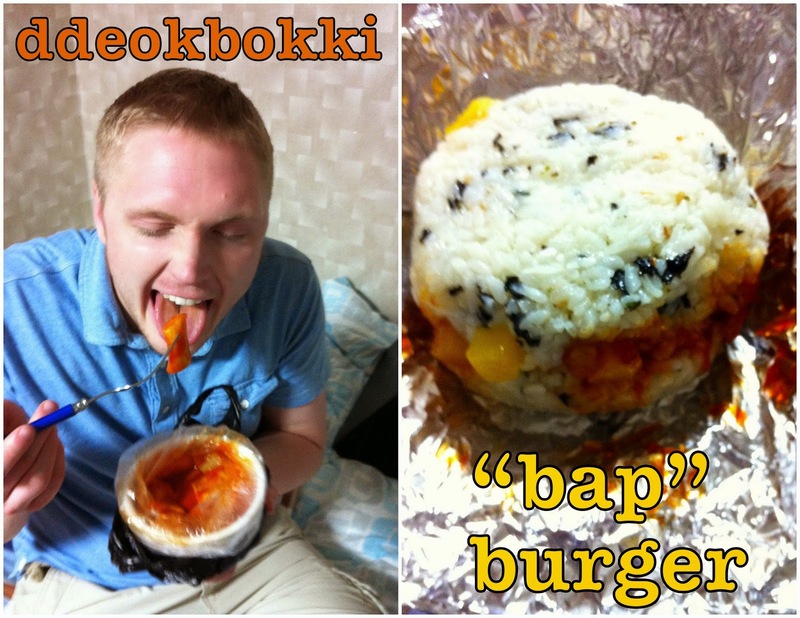 We got some Korean street food (ddeokbokki) for dinner, plus a "bap burger" (rice burger) from a new place in town. The concept is that it's a burger but the "bun" is sticky rice. Perfect for staying gluten free, but very dense! We stopped in a grocery store to get something to drink on our way back, and saw a third grade student of mine who had just checked out with her mother. We went back by the drinks, and then the girl came around the corner, and held out a Vitamin water for me. I was confused and awkwardly froze for a second, but then took it when John said "take it". I think they bought it and decided to give it to me. It felt strange walking back through the check out with an unopened Vitamin water and not paying for it, but John pointed out that the family probably said something in Korean after I walked by, which the store clerks would have heard and understood. Score! Third grade classes were great today; we started a new unit: How Many Dogs? I spent most of my afternoon at school making the game PPT for our open class (in June) and thinking about the rest of the lesson plan. I'm not sure when my co-teacher will have time to talk about it again, but we have lots left to discuss and organize, I think. The computer in my second grade daycare class randomly had an error and shut down twice during class. It was really annoying because I rely heavily on youtube videos to have any chance at keeping their attention. Also, I couldn't read all of the errors in Korean, so I'm not sure what was going on. 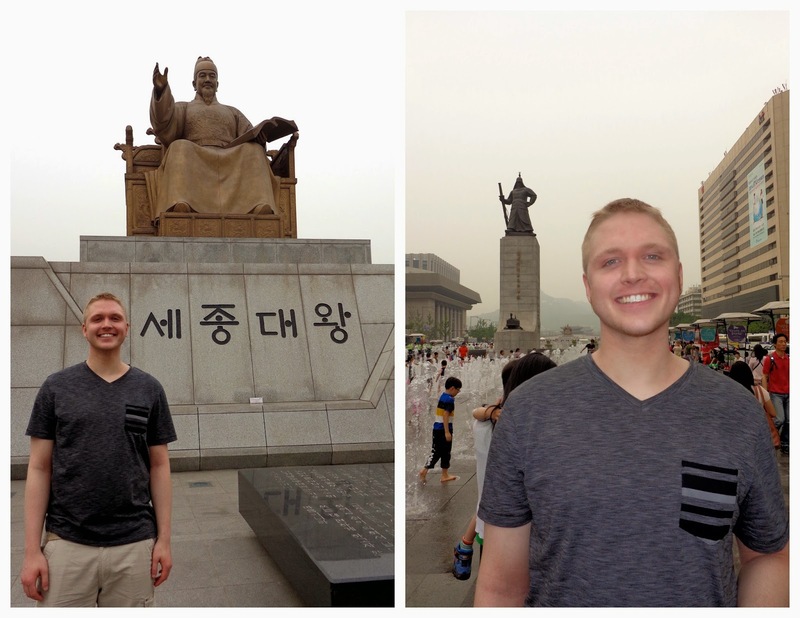 John went into Bundang again today. After school my co-teacher YH drove me to my apartment and we picked up John. 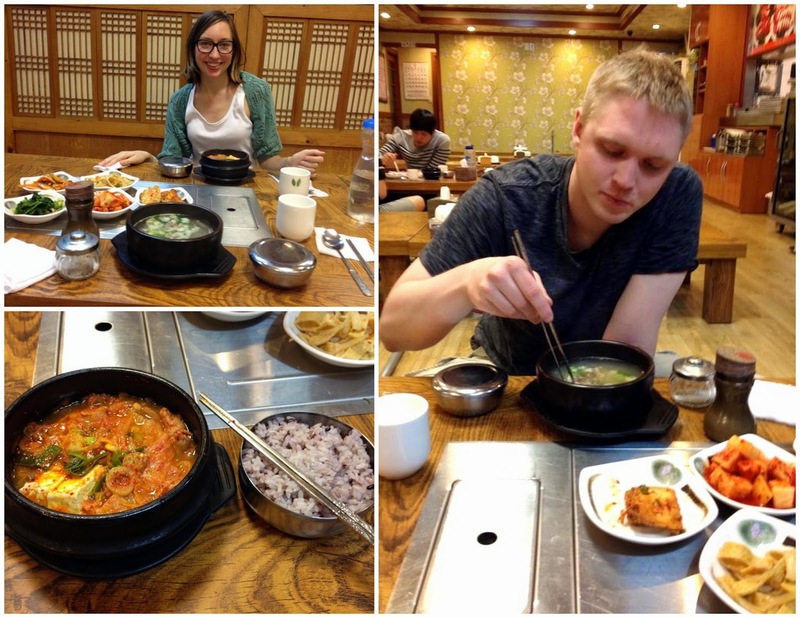 We met my other co-teacher YJ in Bundang for dinner: boiled chicken + ginseng soup. The whole chicken quarter is in the soup, with rice and nuts and some seasoning stuffed inside. So you take the chicken apart with chopsticks and leave bones on the side dish - it was good! Then we got some coffee together before ending the evening. 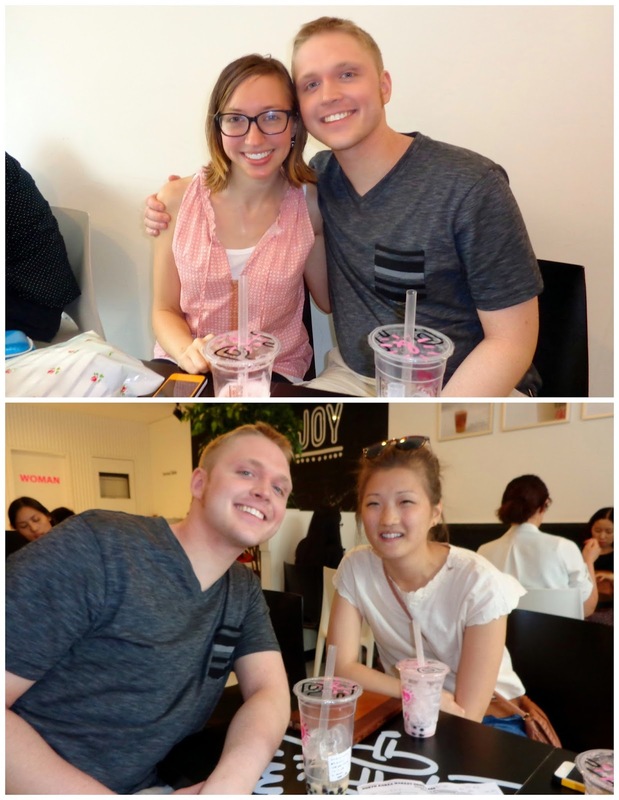 I'm glad John got to meet my co-teachers, and it was nice of them to offer and take us out to dinner this week. The computer shut down again during second grade daycare -- displayed the same screens as it did yesterday. I hope this doesn't become a daily occurrence. Also, during this class it's not uncommon for boys to take stuff out of my basket when I'm not looking. Yesterday they took my squishy ball dice and I had to look around and ask the kids for it after class (they forgot they had taken it and hidden it). Today my water bottle was missing after class - just an old dirty plastic one with plenty of germs on it - since it's been my go-to all week at school with this cough. I asked some of the kids by gesturing until one told the Korean teacher and she asked the class. Then two boys jumped up and said stuff in Korean and led me out of the room next door. Then they led me upstairs to a first grade teacher's room, but she wasn't in there. I guess another teacher accidentally took it off the desk thinking it was hers while I was walking around the students' desks as they were coloring today. The teacher who had it was in a meeting with other teachers, and I didn't want the kids to interrupt it on my behalf. So I'll bring another bottle tomorrow, no big deal, I just feel bad because she'll probably get sick now. And when I left at 4:30 I realized I never had my picture taken today! I think my co-teacher forgot to tell me when to go, or maybe they made the announcement (in Korean) while I was teaching my after school class. Whoops. I don't think they'll notice until they put the yearbook together next fall. 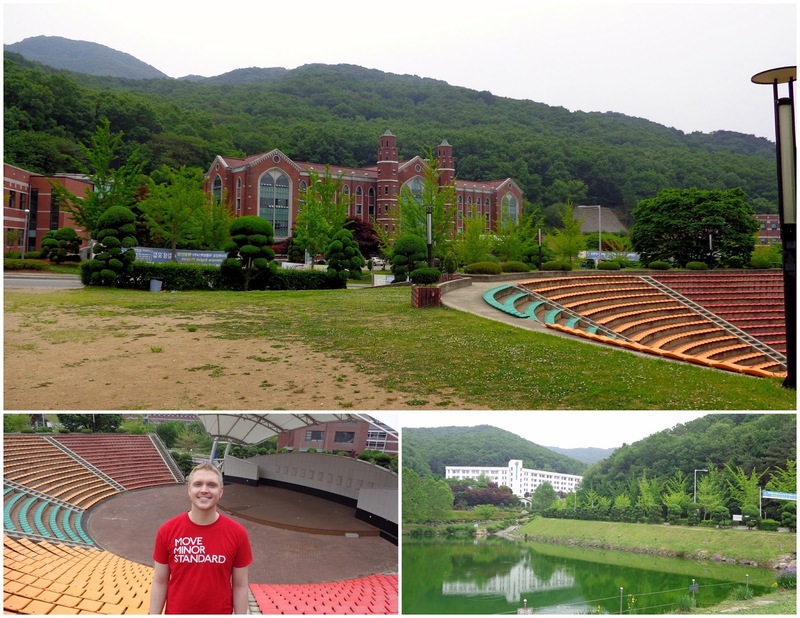 John went into Bundang again for a bit, then came back to town and went for a run. We made some experimental banana/oatmeal/peanut butter cookies (read: blobs) in my toaster oven in the evening. Dinner was at that same Korean restaurant we went to last Sunday. 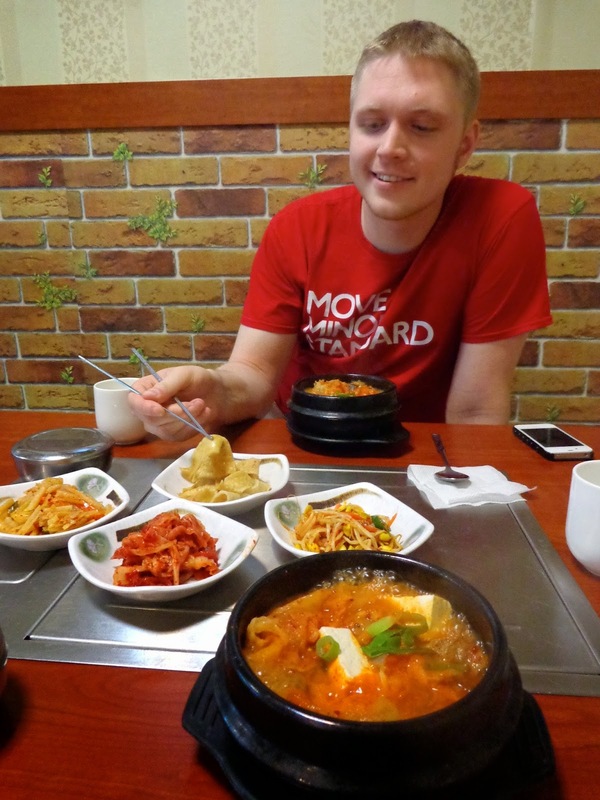 I had kimchi stew again, but John tried galbitang (beef short rips soup). He wasn't a fan of needing to pull the meat from the bone with chopsticks to eat it, but was glad he gave it a try. Happy birthday Mom! I told all of my fifth grade classes that it's my mother's birthday today. They did their shocked gasp (really?? ), then got excited and clapped. Fifth grade classes went better than usual, I thought. I think some teachers' schedules have changed because now when I get to lunch the teacher table is full, so I sat with some fifth graders today. John and I went into Bundang when I finished work. He got a new book to read, and I picked up a few gifts at Artbox connected to the bookstore. 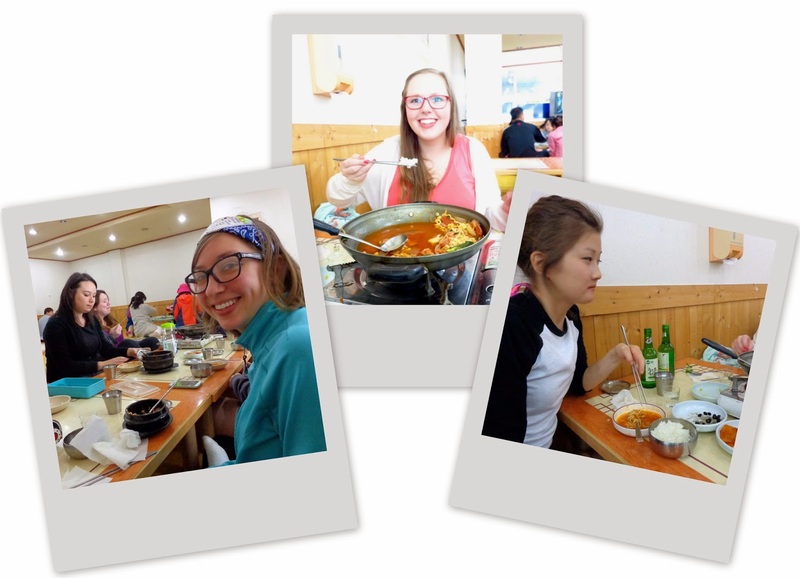 I consider dinner a failure, as we walked and walked around a neighborhood of restaurants, but I wasn't seeing anywhere I'd be comfortable ordering from the Korean menu. I was also exhausted from the long work week, so my mental state wasn't the best for that sort of task that night. We decided to just go home (it was past 9pm) and I got John some kimbap and ddeokbokki near our bus stop to take back for dinner. 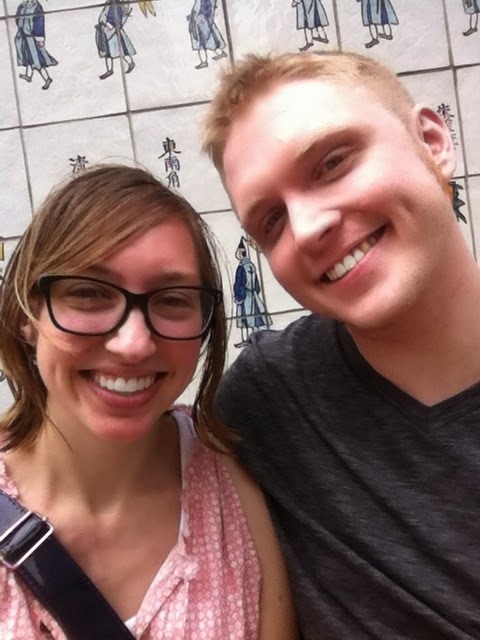 I'm so thankful that John is here in Korea with me, and that he's able to spend nearly two weeks here! 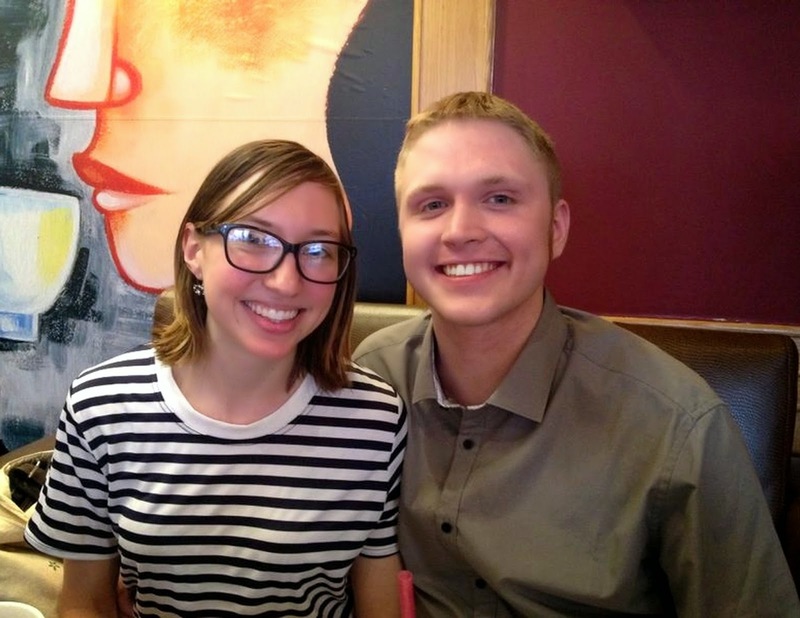 After being a loner for nine months in my town, it's been extra nice to be able to go out and do things around town together: go for walks, eat at restaurants, etc. While reading some articles for my post about why I stopped taking probiotics, I was introduced to the concept of prebiotics. My stance is that taking a probiotic supplement isn't enough, and the necessity of prebiotics is one reason why. To put it simply, probiotics are live bacteria living in your gut, whereas prebiotics can be thought of as food for your flora. Prebiotics are plant fibers that your body cannot digest. But it doesn't go to waste - these fibers nourish the good bacteria in your large intestine, like a fertilizer. Prebiotics are often called soluble fiber. The following raw foods contain prebiotics that can keep your flora fed and happy. I was unfamiliar with some of these foods, so I've included a few pictures and descriptions. The Jerusalem Artichoke is actually a type of sunflower with sunny yellow petals, not an artichoke. The part of the flower that you see below is the "tuber". The Chicory flower (common names: blue dandelion, blue daisy) usually has blue flowers, and its leaves are sometimes used in salads. Acacia Gum, also known as Gum Arabic, is hardened sap taken from two types of acacia trees. Most Acacia Gum is harvested in the African Sahel today, though it was harvested in Arabia and West Asia historically. Prebiotic sources I am familiar with include raw onion, raw garlic, beans, banana, raw leek, and raw asparagus. When looking at figures of how much of these foods you would need to eat in order to reach the recommended daily serving of prebiotics, the task seems impossible. Over one pound of bananas? A quarter pound of raw asparagus? Daily?! It makes me question who came up with these recommended daily amounts, if it wasn't a friend of the prebiotic supplement business, perhaps. I'd also like to point out that you'll ingest the prebiotics when these foods are eaten raw. Cooked onions and cooked garlic, for example, won't provide nearly as many prebiotics. One final warning for any IBSers, eating large quantities of prebiotics may increase gas/bloating/bowel movements immediately after ingesting them. This is probably due to the fact that prebiotics are not common in a typical American diet. I wouldn't let this stop you from eating these foods though, just be aware that it could happen. So you see, probiotics can't (and don't) exist alone in your gut. They need nutrients from prebiotics in order to thrive and keep your flora healthy, which is one reason why just taking a probiotic supplement isn't enough for your interconnected digestive system. I certainly have not been eating foods on this list, apart from my two daily bananas. Last week I bought a bag of sweet potatoes and started eating those, but I should see if any of these food items are available here in Korea. The reality of the situation though is that with under three months to go in this country, it's not a high priority item for me to figure out what these are called in Korean (or if they even exist here) and go on a wild goose chase to find them. Moving forward, I'd like to learn what sorts of foods feed the "bad guys," so I can build habits to avoid those foods. I woke up numerous times during the night, so Monday was a tired day for me. YJ is still playing around with ideas for our open class on Wednesday with a sixth grade class, so today she tested some different activities. All four of the sixth grade classes we taught were different. I was really tired during my two daycare classes. My co-teacher YH actually moved most of his desk stuff (computer) into the English room on Friday. Still no word about when I should move, or where exactly my desk is moving to (I've heard different things from each co-teacher). The Vice Principal and Principal came into the English room again this morning as YJ and I were preparing for class. They looked at the space and shelves, while talking with YJ. I wish I knew what they were saying! We did some more experimenting with the sixth graders today (different activities with different classes), and then we finally chose the activities for tomorrow's open class. After lunch I typed up the new lesson plan and put the PPT together. YJ told me I'll be lead teacher and she will support. Later in the afternoon a bunch of first and second grade teachers brought in a couch, little sofa, and long coffee table into my (old) office that I'm still in. YH said tomorrow I will move next door into the 3rd grade office. There's hardly any room to stand now in the 1st/2nd grade office, so we need to get our desks out of there. Our first period (open class) started ten minutes earlier than normal today, and the rest of the periods followed suit. All of the teachers were dressed really nicely (me too! 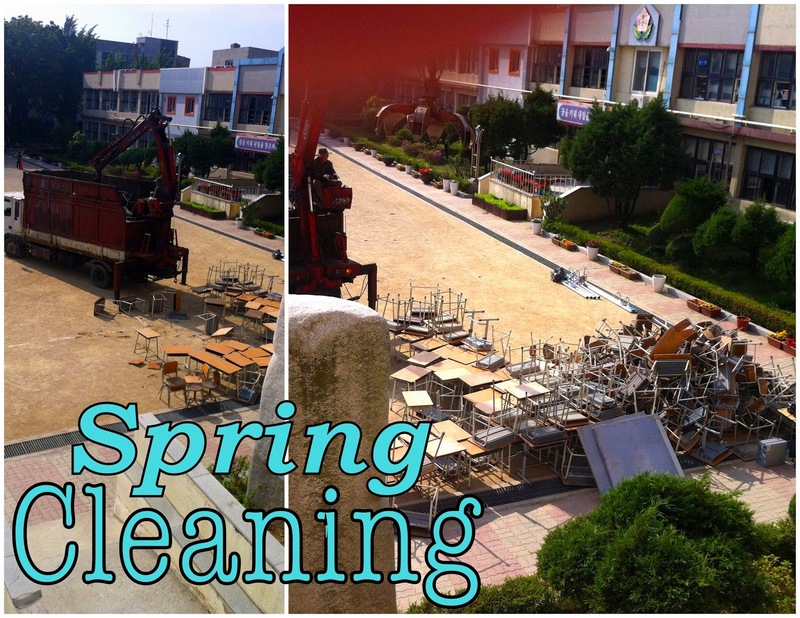 ), parked cars filled the dirt field in front of the school, and parents roamed the halls. There were maybe six parents during our open class? I only looked at the children, and some parents were in and out, so I'm not sure of the exact number. I do know that it was more than YJ expected. The class went well, and we had good evaluations from the parents. At 2 in the afternoon my desk got moved... to the English room! Surprise, surprise. I'm not sure why YH kept on telling me I'd be in the 3rd grade office. This morning he changed it and said I could choose, the English room or the 3rd grade office. But later talking with YJ, it was assumed I'd be moving to the English room. Anyways, I like the sunshine and windows over my desk in the English room. Hopefully I have internet tomorrow. I did some major organization of the shelves that were crammed with old English books, binders, folders, flashcards, junk, and dust, dust, dust. Darn, I really should have taken a before picture. It's not done yet, but I'll take a photo of the finished product. Saw a clothes-stand truck on my walk home - bought a dress and three light summer tops: score! Saved me a trip into Bundang or Seoul, and they were $5 each. Again, I woke up a few times last night, around 3 and 4am - like every night since Sunday. YH said that the desks they moved out yesterday (of the basement, I think) were from the last ten years, and he estimated they were 200 desks . During our last fourth grade class, my co-teacher announced to them that they'll be the open class in a month. Our Principal, Vice Principal, and English teachers from other districts would be coming to watch the class. Yikes. I'm more nervous about this one because teaching with my new co-teacher still is quite bumpy. And it's a lot more important than any other open class I've had before. We did some major organizing in the afternoon in the English classroom (no Teacher's English Club today). I guess they're remodeling the art room from first floor, so two huge cupboard/shelves from that room were brought into the English room. We had to make room for them and move things around, and then we filled the cupboards with old crap from the shelves I had organized on Wednesday. I had trouble sleeping last night, and my sore throat/runny nose progressed to an I-have-no-voice overnight. So I felt cruddy all day (even though I knew the boy was coming!) and couldn't speak during classes. My two daycare classes in the afternoon were tough without a voice (and internet/youtube malfunctions), and then at 4 I left a half-hour early (got it pre-approved last month with all those signatures) and caught a bus into Seoul. It was only an hour and a half bus ride, and I met up with John no problem. We waited for the next bus, which this time took at least two and a half hours because traffic on Friday after work was terrible. We got to my town a little just before nine and picked up two hot soups to bring back to my apartment. Exhausting day! Also felt surreal. Today I'm thankful for my students. They are kind, cute, adorable, funny, and sweet. They make every day here worthwhile, and bring a smile to my face at school. Seeing their faces around town in the evenings or weekends gets me excited; they're the friends that I have in town. I will miss them so much when I leave here, so I want to be sure to appreciate these kids during every day in the weeks that remain. One of my life list items is "Learn about retirement funds, invest!". I'm checking that list item off this month, and I'll be writing about retirement funds and investing in depth below - you've been warned! 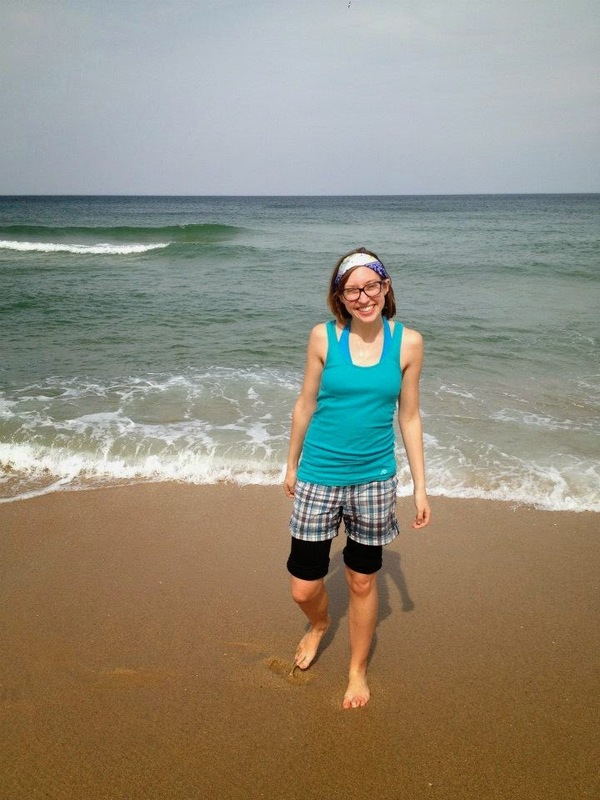 I think I first started giving retirement a second thought when I read 20-something Marissa's post on Missris in October of 2011 about her own retirement research, which led her to open a Roth IRA. But it wasn't enough to make me take immediate action. I taught in Spain for a year, I came back to Madison and worked for a year, and then in May 2013 I finally opened a Roth IRA. What led me to do this? 1. Set aside $1,000 for emergencies. 2. Pay off any credit card or loan debt. 3. If your employer has a matching program for your 401(k), participate. That's free money. For example, let's say your employer matches up to 6%. This means if you contribute 6% of your income to your 401(k), then your employer will also contribute 6% of your income to your 401(k)! Free money! 4. If you make less than $129,000*, open a Roth IRA. IRA stands for Individual Retirement Arrangement/Account. There are actually 11 types of IRAs, but the two most common are Traditional and Roth. *If you file single in 2014. You must make less than $191,000 to contribute to a Roth IRA if you file married/joint. Check limits each year. Before I begin to dissect the Roth IRA (since it's pertinent to my situation), I'll share some resources where you can learn about the differences between Traditional and Roth IRAs (for you curious folk). So the Roth IRA is a personal account you can open independently to save for retirement. There is a maximum amount that you can contribute to your Roth IRA each tax year. The maximum contribution amount is $5,500 for 2013 and 2014. As you can guess, it's recommended to contribute the maximum to your Roth IRA each tax year. You cannot deduct your contributions to a Roth IRA from your income. This means that if you make $30,000 and contribute $3,000 to your Roth IRA, your income when you file taxes is still $30,000 (not $27,000). A huge plus is that all of your contributions and earnings are completely tax free when you start using the money during retirement, if you follow the regulations (you are age 59½ and your Roth IRA has been open for at least 5 years). So if some of your Roth IRA is invested in Google and you make a ton of money over the next 40 years - it'll never be taxed! Check out the IRS's page all about Roth IRAs to learn more. You can open a Roth IRA at some banks and credit unions, but I opened my account online. Three main investment companies where you could open a Roth IRA are Fidelity Investments, Vanguard Group, and T. Rowe Price. There are also many discount brokers, one of which I used to open my account online (Sharebuilder). Each broker (and company) will have different account minimums and trading fees, so take some time to look around and compare. In hindsight I think I made my choice too quickly, now that I'm learning a lot more about Roth IRAs, but it's okay for now. Back to my story. So it was May of 2013 that I opened a Roth IRA account on Sharebuilder, and put in $500 to start. That part was super easy, opening the account. And then I started to take a look around. I had to invest this money somewhere by myself, and most of the trades cost money to make. What do I invest in? If I add money to the Roth IRA monthly, does that mean I'll have to do a separate trade each time too? Won't it not be worth it then? Should I only make trades once a year? Twice a year? And there was all of this fancy finance lingo I didn't understand: Capital appreciation, yield, ETFs, index, gross expense ratio, order type: market or limit -- ahh, what have I done?! I'm out of my league! So there the $500 sat. And sat. And sat. In the back of my mind it was okay to let it slide, because I was still paying on my student loans. Yet when I became debt free in December 2013 that $500 in my Roth IRA still sat untouched and uninvested. After some hints in February and March (I don't remember exactly what got me moving, but it was probably some blog posts I'd read), I added an action item for April: Research retirement/Roth IRA investing online for an hour each week. While I only nearly reached two total hours that month, I felt I'd learned enough to bite the bullet and invest some of this money. I also kept reading again and again that you should save for retirement yesterday. Open a Roth IRA and invest today! So earlier this month I added some more money to the Roth IRA, and then bought shares of two mutual funds that didn't have a trading fee. I wanted to buy shares of a recommended Vanguard mutual fund, but the minimum initial investment is $3,000. So I'm going to make smaller monthly contributions to my Roth IRA, and when I have enough I'll invest it in that Vanguard fund. I plan to make the maximum contribution this tax year. Some advice I read and appreciate was to not check your Roth IRA every day, week, nor month. A few times a year is all it needs. Investments that grow over time can have daily losses, so if you're constantly checking you'll drive yourself crazy. My research has only just begun - I barely know anything about all of this investing business. I still have to learn more about retirement accounts (aka where is the retirement account from when I worked for the State of Wisconsin? Floating in cyber world? How can I see/access the money?). And I have tons to learn about investing: How often should I make trades? What funds are best to invest in? Should all the money in my Roth IRA be invested, or should I leave some untouched? Any recommendations as I continue learning about investing/retirement accounts? Are you saving for retirement? Many months ago, maybe it was in January, I unplugged my apartment's microwave and put it down in a cupboard. It's stayed there ever since. John's family hasn't owned a microwave in years, since his mother is very health conscious. But most Americans do own and regularly use a microwave. If you would have questioned my microwave usage a few years ago, I would have told you that you're crazy; microwaving is absolutely safe. Younger me probably would have also said something along the lines of: You have no science to back that up! Show me the proof! Ever since I was born, there's been a microwave in the house I lived in. When you grow up with something that's so commonplace among homes in society, it's hard to imagine a time without it - let alone that it could be harmful. I really had to break some deep assumptions and change the way I looked at the world in order to question my microwave usage. Okay, and now back to me. So take every other living creature on this earth. Do they eat food that has been heated by forcefully sending electromagnetic waves through it in order to heat it up? Negative. In fact, we're unique in the fact that we cook any of our food at all. Nearly all other organisms eat raw, and look at how healthy they are (excluding, of course, creatures that have been harmed by human pollution/existence and human destruction of their habitats/food sources. Arg.). In America, food has become troublingly disassociated from what it actually is. The other week I was on a group trip, and overheard an American girl at the neighboring lunch table saying that she had been served a full fish the other week at her school - head and all. "I don't want to see that! I mean, come on, get that off my plate!" she squealed, as her lunch mates nodded in agreement. Woah, everything you eat was alive at one point! Well, unless it was created in a factory, in which case that's not food, so please don't put that in your body. Convenience and busyness have dangerously damaged what meals mean to people these days. Now food is often something you cram in your mouth while driving, perhaps after leaving a drive-thru, or something eaten while spending time online, focusing on other tasks. Eating has become thoughtless, just like microwaving. Food, composed of nutrients from the sun and earth, fuels our bodies through a complex, interconnected system. I am what I eat, and you are what you eat. There's a reason why microwaved food doesn't taste as good, and why blood warmed in a microwave killed the patient into whom it was transfused. I cannot pinpoint exactly what molecular reactions/alterations are taking place, but I don't need to. I don't need that information; I've made the decision based on my thought process above. The choice seems obvious to me now. And this isn't the type of choice or issue that requires specific scientific evidence, either. I'm not pushing it on anyone else, and the effects of not using a microwave to warm food are only beneficial to my health, if anything. Most things that come with microwave instructions probably aren't real food in the first place, so without a microwave you'll easily avoid them. I have a kettle for hot water, which is perfect for making tea or instant oatmeal. I also have a toaster oven in this apartment, which I use to bake vegetables (hello sweet potato!) or to make oatmeal/banana cookies (read: blobs). To reheat leftovers, I simply do so in a pan on the stovetop. I'm curious - Do you use a microwave? Have you ever thought twice about its effect on your health? As per usual, I love teaching sixth grade with YJ. We're still in the birthday unit, so they've learned months of the year and ordinal numbers (to say dates). YJ tells me that we'll have an open class with sixth grade next Wednesday. Daycare classes went alright today - the second graders were asking for the Angry Birds game (PPT) that we had played on Friday. Guess I'll have to use that again soon. I edited YJ's open class lesson plan at the end of the day. Five day market after school - bought a corn dog, I know, I know. But they're W 700! (That's less than 70 cents! 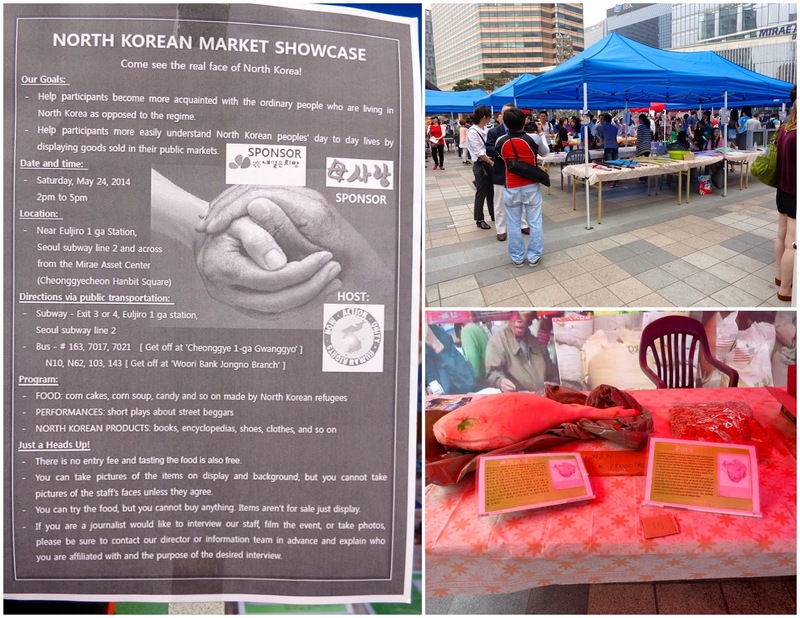 ), and I like taking part in the market. I shan't do it again! Talked some more about the open class with YJ - we decided to change the main activity to a poster project where students choose (or create) a "Special Day" (holiday), and then use the textbook language to write about it (using phrases provided - or creating their own, if they're at that level). I had no afternoon classes, but somehow did not get to work on Summer Camp, and barely made a dent in daycare planning. After school I updated some software on my computer at home, which had over an hour's waiting time, so I read in bed and then completely dozed off for around two hours. That's the first time I've napped in the afternoon here, and I woke up around 8 p.m. I think I needed the extra sleep to get rid of this cold, though. Our third graders had fun doing an activity with party hats and gift boxes (Happy Birthday unit). Between classes the Vice Principal and Principal were in the English room, looking at things I think because the first and second grade teachers want my co-teacher YH and I to move our desks back into the English room, out of their office. I learned today to always stand when the VP/P enter the room, because I sat back down after my co-teacher started talking with them on the other side of the room, and then she did a hand signal behind her back telling me to stand up. Whoops! Today was Teachers' Day here in Korea! Just a normal day, though. Fourth graders started a new unit today, learning three prepositions: in, on, under. After lunch I played biseokchigi with my sixth grade friends again. Later my co-teacher asked if I've heard that we need to move from our office. Yes, I've heard. He says that his desk will move to the English room, and mine will move next door to the third grade teachers' office. Hmm this was the first I've heard of that - I thought we were both moving to the English room. I'm curious as to how the arrangement was decided (The third grade office has teachers in and out all day. It's a small room where the new color printer is housed, and where the teachers have coffee breaks.) We'll see when the move actually happens... I thought we were moving last week and still no word of a move date. I had dinner with my Korean friend after not meeting for many weeks, and then G+ed with Hannah in London. After second period with fifth graders, some younger kids came into the English room. What are they doing here? "Oh, I forgot," my co-teacher told me, "It's club day". One Friday a month (usually the third, perhaps) the kids have "club time" during third and fourth period. That means whatever classes we normally have during third and fourth get pushed back after lunch to fifth and sixth period. This overlaps 10 minutes of my first daycare class, so usually it's an exhausting afternoon of four back-to-back classes, no passing time between the last three. At lunch I track down the first grade teacher and tell her I'd come at 2:30 instead of 2:20 today. And then as luck would have it, after fifth period I'm waiting for the last fifth grade class to come and nobody's there when the bell rings. YH had left the room a few minutes earlier, I'm not sure where he is so I just wait. He comes back a few minutes later saying we won't have the last class, their homeroom teacher is keeping them this period. Yay! So I had a little breather before starting my two after school classes. TGIF! Ah, and when I got back from my last daycare class all of the teachers were cleaning, mopping the hallways (I'm assuming in preparation for next Wednesday's open house), and YH had moved his desk into the English room. I wonder if they'll have me move on Monday. More importantly: The boy comes in one week!! May 15 is Teacher's Day here in Korea. 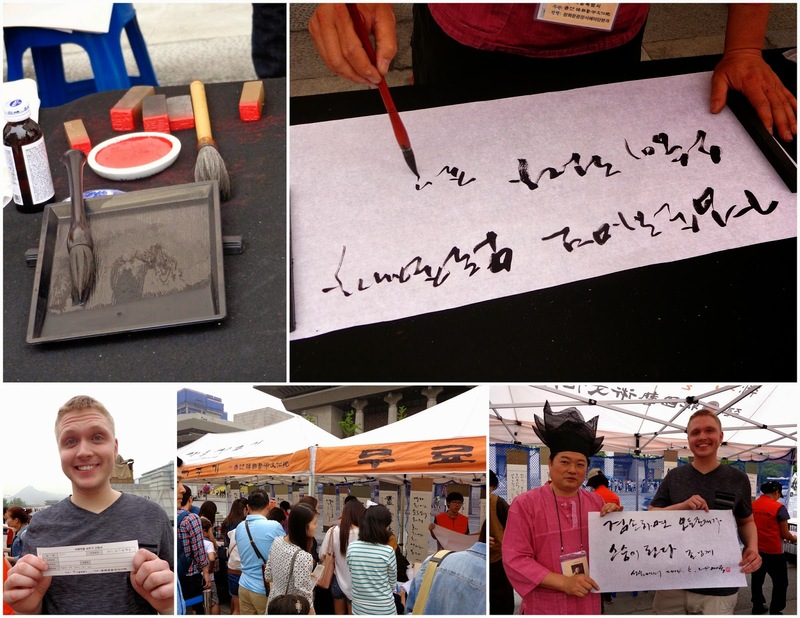 My day was just like any other Thursday, with the addition of a letter from a young third grade boy (written in Korean). Hence today I'm thankful for all of my past teachers. I had some great Spanish teachers in middle and high school, which kept me interested all the way through college (Had some great TAs in college, too). And that led me to two years in Spain! I had some fantastic homeroom teachers in my elementary days, as well as top-notch subject teachers in middle and high school. I never thought teaching was easy, but after this year I can say it's a tough career, but oh so rewarding. Teachers need to be thinking about a million things at once, and paying attention to small details while stepping back to see the big picture at the same time. In class you've got to keep everyone engaged and focus, which isn't easy when you put 30 young kids together. There are always students who thrive from negative attention, bothering their classmates and disrupting class. Some kids are hungry, others tired, some angry, and a few might be super-energetic. (If you teach middle school you've got to deal with adolescent kids every day...) And you can't just grab the students' attention with anything, they must be learning the target objective, expanding their knowledge. Some kids' families have money for private lessons, so they could be bored and not challenged, while the student sitting next to them can't read. You also must be able to assess each activity/lesson and the students' understanding. Do they need more practice with x? Do they understand y? Was this a good activity or does it need some tweaking before the next class starts in 10 minutes? You must be able to keep track of time and be flexible based on the students' moods and reactions. Perhaps you planned 10 minutes for an activity, but the students are really enjoying it and benefiting from the language practice -- add five minutes. Or maybe you thought an activity would be great, but it proves to be too difficult and you're losing them quickly -- change things up and improvise or use a back-up. That's just the teaching. Don't even get me started on how much time it takes to lesson plan. Coming up with ideas, and then creating the materials (PPTs, worksheets, flashcards, game boards, etc.) needed to do such activities. Many teachers must keep a grade book and write progress reports. You're also expected to please all of the parents - each with different viewpoints who are only focused on one child - so it's hard for them to realize your focus is on hundreds of children (or 20-30 for one class). I won't go on, you get the picture. It's a demanding job with ups and downs. You're the teacher all the time, no matter where you are. I'm walking down the hall, I'm still the teacher. In the bathroom, you're the teacher. See a student out at the grocery store? You're the teacher. It's like a mini version of politicians/celebrities. You're identifiable to much of the community, even outside of school. But being a teacher is such a wonderful opportunity. You can change a child's life. Change a mind, change a life. Encourage a student that everyone else passes off as "the bad kid" or "the slow kid", and they will respond. Teach children mindfulness early on, and set them up for a lifetime of success. Believe in your students, and they will thrive. So thank you teachers, wherever in the world you are! I appreciate all you do to educate others. (And now a family shout-out to all the teachers in my family: Mother, sister, even all of the second cousins!). 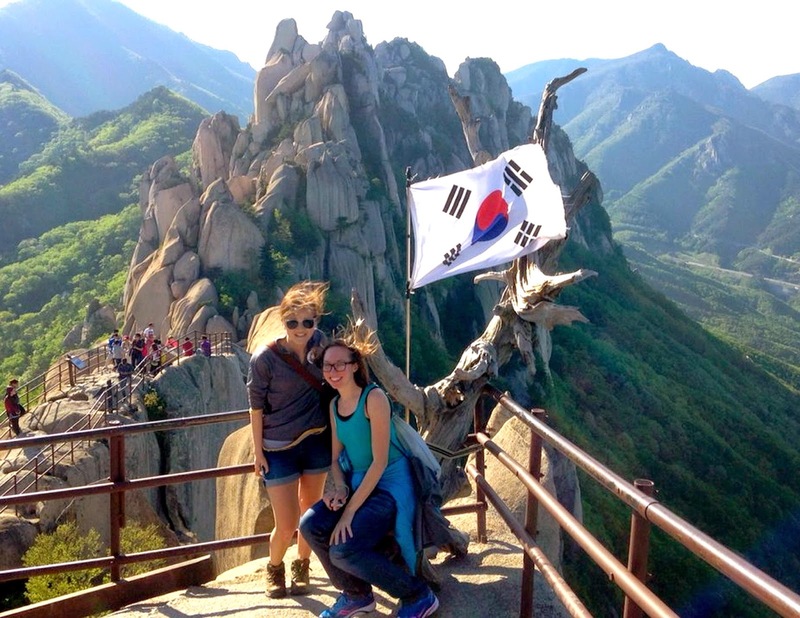 Happy (Korean) Teachers' Day! The book Whole: Rethinking the Science of Nutrition completely changed my mind about health supplements and vitamins; I do not see myself buying (or taking) them from this point on. "But what about probiotics?" I found myself asking. Surely those must be in some magical category separate from health supplements, right? I'd been so proud of the fact that since January 2014 I was taking them daily. Heck, I even wrote a post in April titled "Taking Probiotics Daily", in which I shared how I developed the habit of taking a probiotic pack every day. Also, probiotics are recommended in nearly every IBS article that I've read, so why should I doubt them? The skepticism lingered on in my mind, and I subconsciously stopped taking my daily probiotics! I let myself experiment, wondering if I was better off without them. It's almost been a month now, and I haven't noticed a difference (Though they never seemed to improve my digestion in the first place). But that's not why I'm not ordering any more probiotic packs after I finish my existing two boxes in the cupboard. In short, my simplistic natural approach is at it again. If you can get Vitamin C through a whole food, eat the whole food and not the tablet. So if you can get probiotics through fermented foods, why am I taking a manufactured powder? I do not think that probiotics are inherently bad. If you absolutely must take an antibiotic, then definitely take probiotic supplements before, during, and after - to do the least amount of damage as possible to your flora. But for someone wanting to improve and sustain all of the micro-life in the gut, it's important to note that fermented foods have a much greater variety of microorganisms than probiotic supplements that are sold on the shelves. And variety seems to matter. A healthy gut has about 1,000 species or strains of bacteria inside, but people with IBS have 25% fewer types of bacteria than healthy people. One's variety of bacteria is obviously affected by what is consumed and introduced into the gut. I had been missing the big picture all of these years: You can't just take probiotic supplements, you must also change your diet and lifestyle. How can the "good bacteria" survive if it's outnumbered by the bad? How can the helpful bacteria thrive if the food you're eating is actually feeding the harmful guys? How can the micro-organisms inside of you evolve and keep up with the changing micro-world if you stay in a highly sterilized indoor place most of the time? Taking a daily probiotic supplement and calling it a day just doesn't cut it. Eating foods that are rich in soluble fiber (like brussel sprouts, yams, potatoes, sweet potatoes, nuts, oatmeal, oranges, apples, avocado, and broccoli), is a great way to help the bacteria in your gut. Also, don't be afraid to come into contact with bacteria and spend some quality time with nature. One final swing at probiotic supplements is that their statements are not verified by the U.S. FDA. I've read about studies where probiotic supplements were tested and had up to 50% less live microorganisms than advertised. Relatedly, the probiotic packs I have been purchasing and consuming (Dr. Mercola's Probiotic Packs) do not need to be refrigerated. I have seen again and again that if you don't need to refrigerate it, you're not getting many live cultures (or something like that). I don't know what the right "answer" is, if these non-refrigerated packs have any positive effect or not, but I just wanted to share this final doubt about my probiotic packs. Regardless of the truthfulness of claims on probiotic packaging, or whether or not they require refrigeration, taking a probiotic supplement is not the path to a healthy gut. Digestion is best when there is a large variety of micro-organisms inside, which can't be obtained from probiotic supplements containing only single-digit numbers of different bacteria strains. While probiotics can certainly be beneficial if you're forced to take antibiotics, eating fermented foods and maintaining a diet favorable for the "good" bacteria is a much better route to digestive health. All of this new information has me asking even more questions: What are prebiotics? What strains of micro-organisms are currently in my digestive tract? Which bacteria would improve my digestion and how can I introduce them into my body? What should I eat and avoid eating to sustain the helpful bacteria? So I have lots to read, learn, and investigate yet in order to have more of my health. I'll share the journey here, of course! I'd love to hear about your thoughts and experiences with probiotics! Do you take probiotic supplements? Have probiotics helped reduce IBS symptoms? Will you continue to take probiotic supplements? 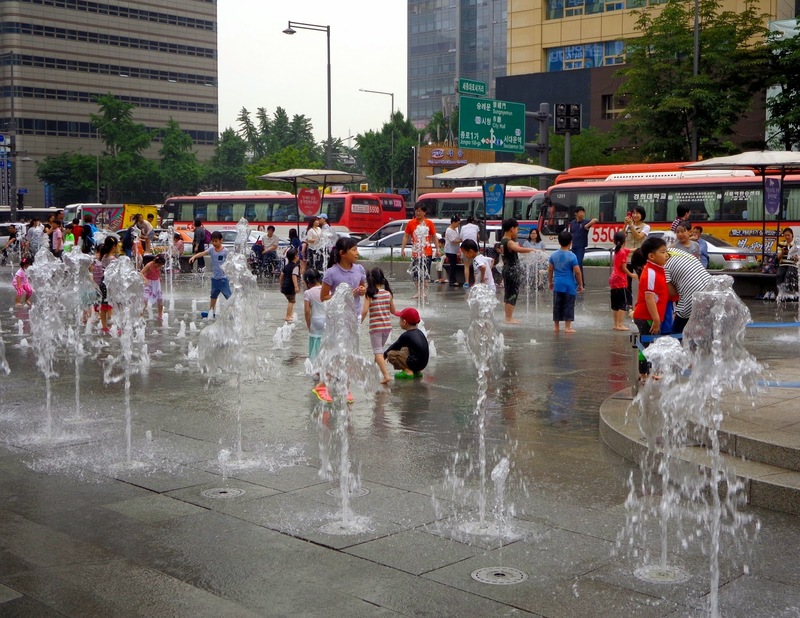 Today is Children's Day, a national holiday in Korea. 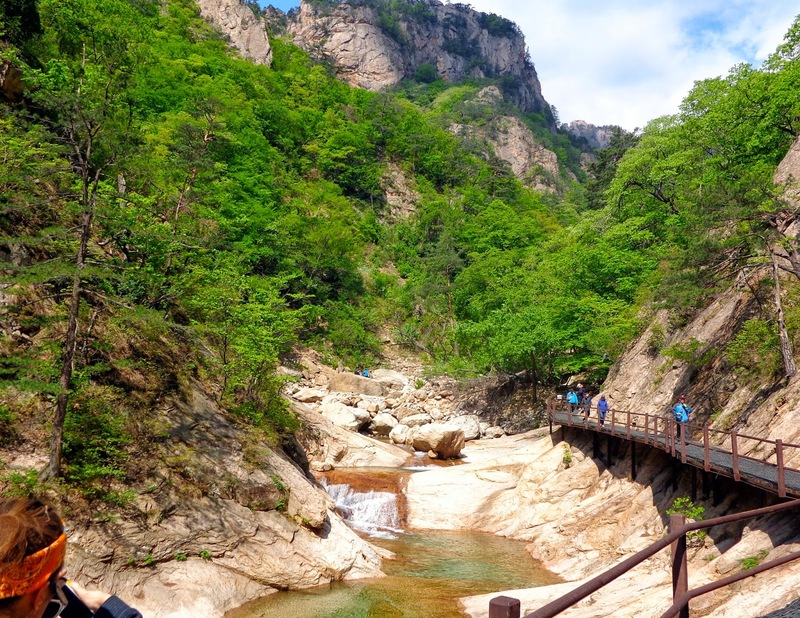 It was the final day of my Adventure Korea trip to Seoraksan National Park. 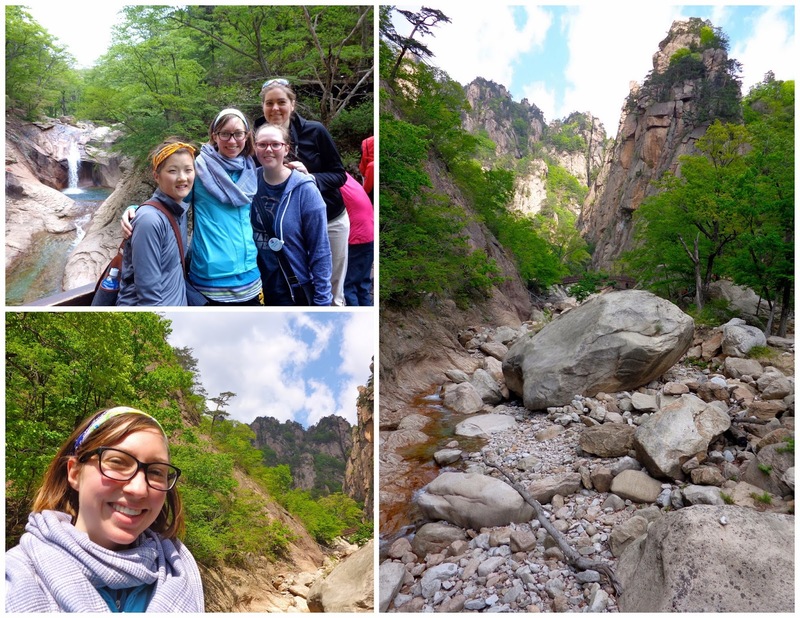 After spending the morning on another gorgeous hike, the next 7 hours were spent on a bus back to Seoul in bad traffic, followed by 2 hours of a combo metro, train, + bus ride home. Today is Buddha's birthday, another national holiday in Korea. I spent the day unpacking, doing laundry, cooking, reading, watching Orphan Black, making videos for my Give it 100 project, and G+ing with my London loves, Hannah & Herm. So nice to have the extra day to relax and catch up after a weekend away. I learned today from my co-teacher that all Korean kids currently get school lunch for free. This change was made about three years ago, she thought. She also mentioned that I'd be getting another after school daycare class either this month or next, which'll put me at 7. That's all I was told, no idea when or what grade (fingers crossed that it's not another day with the second graders who I already see four times a week). One of my regular third grade classes was cancelled today, and my after school second graders were quite tolerable because it was a smaller group without the most rowdy boy. 5-day market after school on my way home. I hadn't taught fourth graders in over two weeks due to May 1 (Labor Day) falling on a Thursday, and not having classes with them on my birthday, which was the Thursday before that. No Teacher's English Club today, my co-teacher cancelled it because teachers are busy. After school on my walk home I saw two fifth grade girls across the street - one was crying. The way she held her hand over her mouth made it look like she'd been hurt there, so I crossed the street to see what was the matter. This girl was so sad and it broke my heart to be unable to say something she'd understand in order to comfort her. I put my arm around her (as some passersby looked on curiously) and said some things in English that I'd say to a crying English-speaking child, but I had no way to understand why she was crying and if I could help. Incredibly frustrating! So I awkwardly stood there with the two girls for a while because I couldn't leave her like that, though she never did stop crying. At one point the quiet friend appeared to be looking for something in the flowers nearby, so I guessed that maybe the crying girl had lost something. I also realized she was just doing the typical Korean hand covering the mouth, like when we're eating lunch, so she wasn't physically injured. Finally I gave her one last half-hug as she continued to sob with her head down, and I made the okay sign with my hand to her friend. The friend and I made eyes and we nodded at one another before I waved goodbye. That encounter broke. my. heart. I was anxious to see the crying girl in class today - she's in my fourth period class on Fridays. I saw Holly and her little sister on my way into school that morning. My co-teacher was outside training kids for Sports Day (as he's been doing most mornings lately) when I realized the English room key had gotten locked inside the room yesterday. So I couldn't set up ahead of time. We were rushed (per usual) in setting up just a few minutes before the bell rang. No students. Turns out our first period class had been cancelled. (This was really lucky, because I'd been getting a cold and today my voice at about 60%.) When the "crying girl" came in fourth period she was her usual energetic, smiling self. I asked if she was okay now and she said a bunch of Korean at me, trying to explain what had happened. I think she lost a bag/pouch or something. Doesn't matter, what mattered is that she was happy again - it was a relief to see her as her joyful self. One first grade class followed by one second grade class that afternoon and I was done for the week. Short weeks are so grand (and rare)! 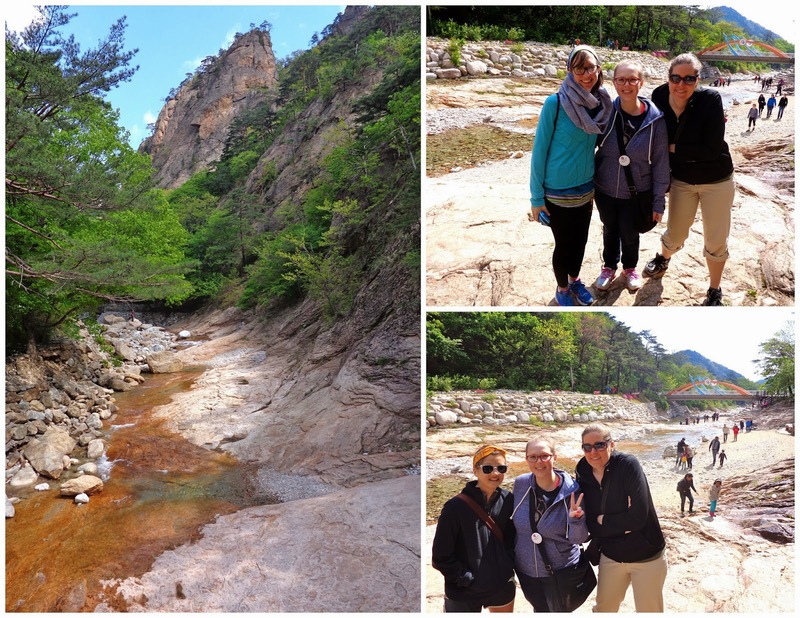 This past Saturday to Monday I was on an Adventure Korea trip to Seoraksan National Park. 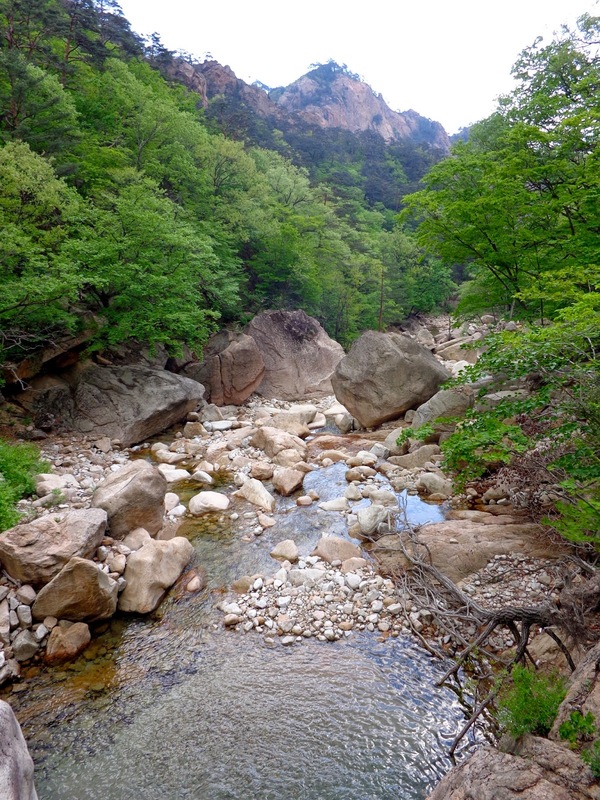 On Saturday we drove from Seoul to Seoraksan and went on a gorgeous hike during the late afternoon. On Sunday we had the option of either waking up early and going on an 11-hour hike, or zip-lining and spending the afternoon at the beach. I opted for the zip-lining/beach, even though the long hike was shortened to seven hours and I'm sure it was physically rewarding and visually appealing. But I've never zip-lined before, so I wanted to take advantage of the opportunity. 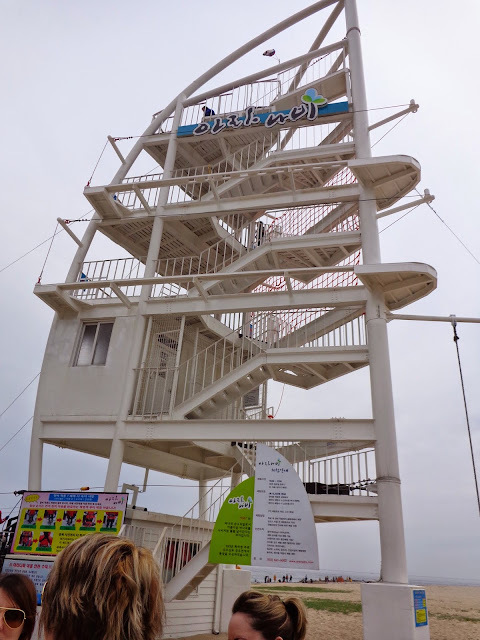 Somehow Abby and I ended up last in line, so here's where we stood for about an hour while the rest of the zip-liners went across one at a time. The wait didn't feel that long though - time flies when you're in good company! 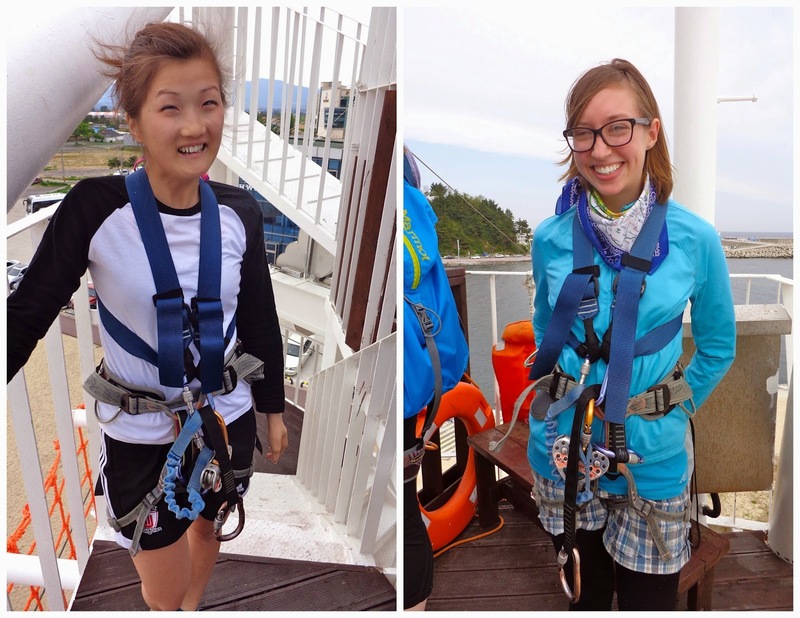 When we were up, we stepped into these harnesses - I'd never before had so many carabiners attached to me at once! 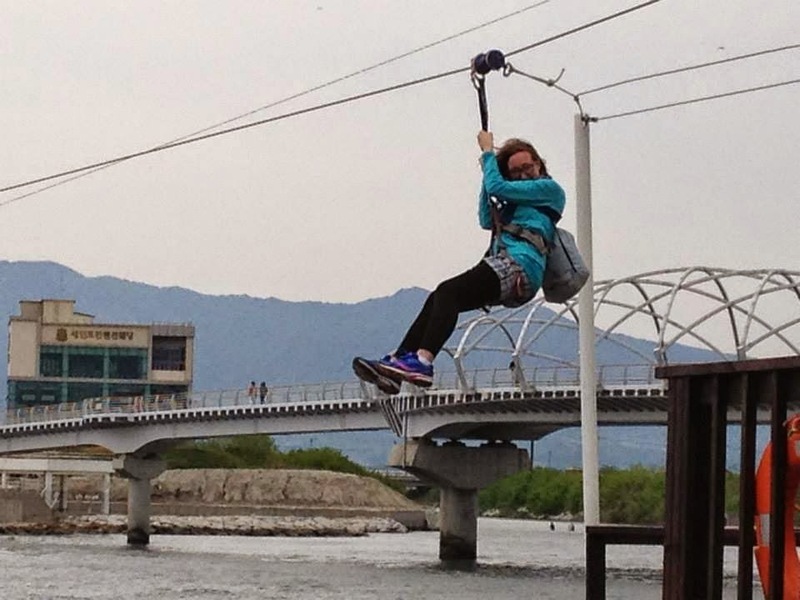 It was a short and smooth ride over the water, the perfect first zip-line - nothing extreme. It's not super fast, so the ride across was quite enjoyable. Abby went first (above), and Anne captured my landing (below). 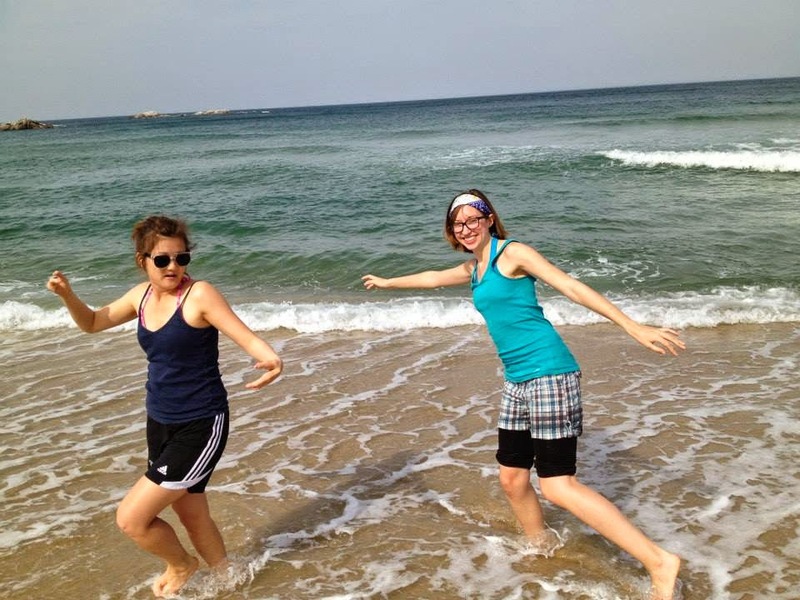 Then the bus took us to Gyeongpodae Beach where the three of us got lunch right away (Maggie was on the hike). It was deeelicious! And then we had a few hours to relax on the beach! It wasn't necessarily sun bathing weather - all beach goers that day were fully clothed, many in long sleeves (except for four men we saw in speedos). We dipped our feet in (I ended up dipping my whole bottom half in while retrieving some kids' plastic sand shovel) and the water was absolutely freezing. I've put my feet into cold ocean water before, but nothing this cold. In that moment, I could only think of the Sewol ferry passengers that were fully submersed in water this cold (or perhaps colder). The thought passed as I was brought back to the present moment. The afternoon was wonderful; I was grateful to be on the coast and in the presence of friends. That evening the bus drove us back to the motel and we got dinner with Maggie right away. Then it was off to the noraebang! Nor-ay what? 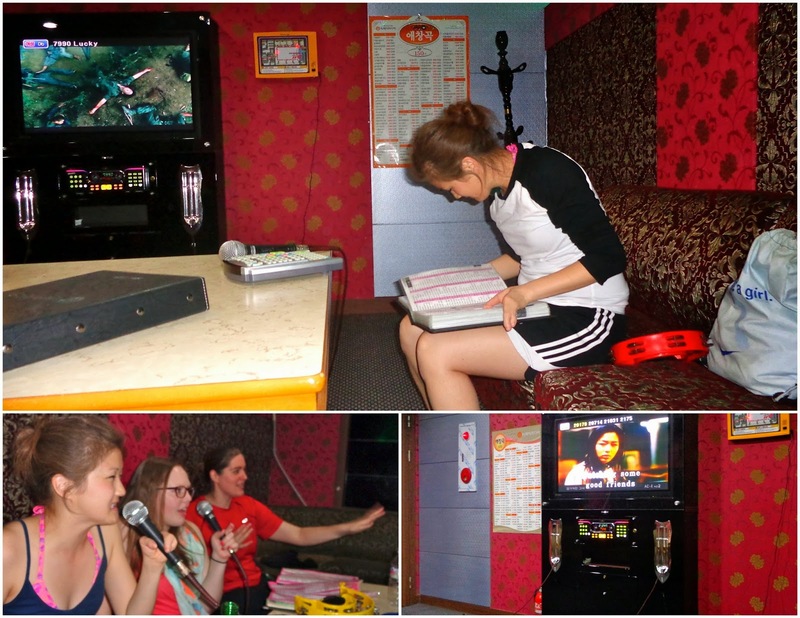 A noraebang is a "Singing room", a place where you pay to sing karaoke with your friends in a private room. They're all over Korea - my town has multiple, to give you an idea. And I hadn't been to one prior to this trip. It was so much fun! You get to choose all the songs you want, and there's no waiting like at karaoke in bars! You get to sing every song and no one else has to listen to it. You guys, there were even tambourines in the room!